Technically as I write this, it’s closing in on Saturday. Friday was so jam packed I’m only just now getting to write about it, from here in my tiny boat nest. The day started with more wind, though perhaps less than yesterday. 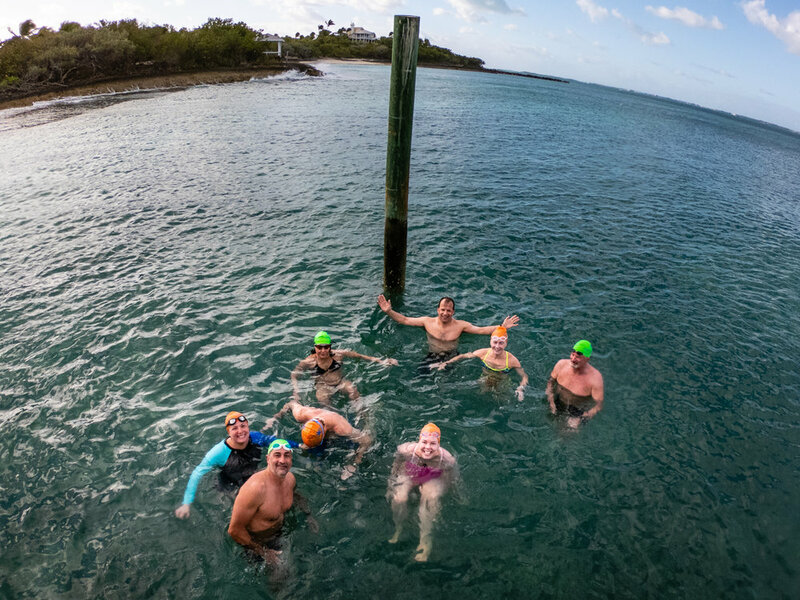 We plotted a swim north (straight into the wind) along Man O War Cay, and made it as far as a big pier in the next bay over. Along the way we saw some of the biggest sea stars we’ve seen yet. We got to the pier and I climbed up for a group photo - no small task for this fish. This group of swimmers, along with swimming so straight, is so confident in their swimming. It’s not about speed, it’s about strength and faith in their abilities to get from here to there in the water. That may sound like a small thing, but believe me, it isn’t, and not every swimmer has it. But it allows us guides to move around freely within a group, or to stop and look at something or shoot up ahead for something else, which is what I did. They all get where they know they need to end up. 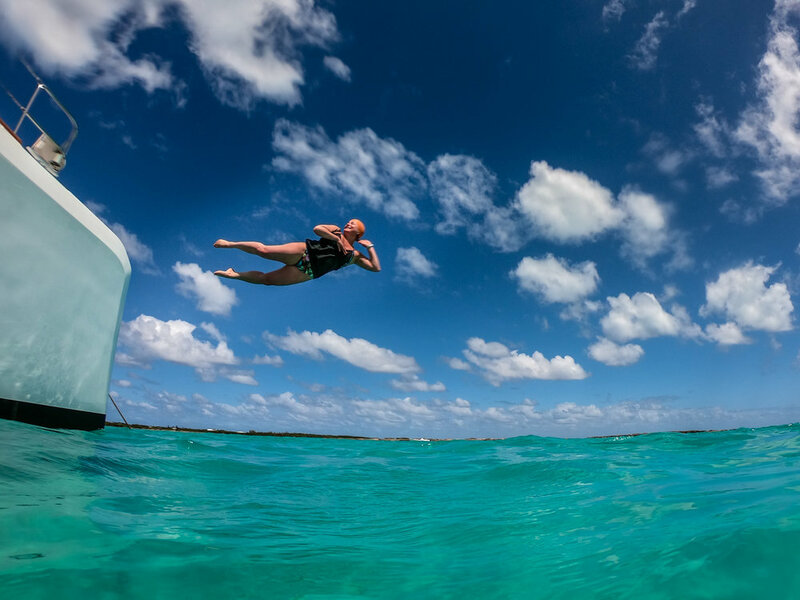 I got back to the boat and donned free diving stuff and the big camera to do swimmer portraits. They each took a turn and jumped in to play for the camera. Robert, our captain of Play, insisted on a photo of him throwing the ball that has become the focal center of play on this boat this week. What a joy Robert has been. No one has ever played quite so much on SwimVacation, and inspired the same of others. 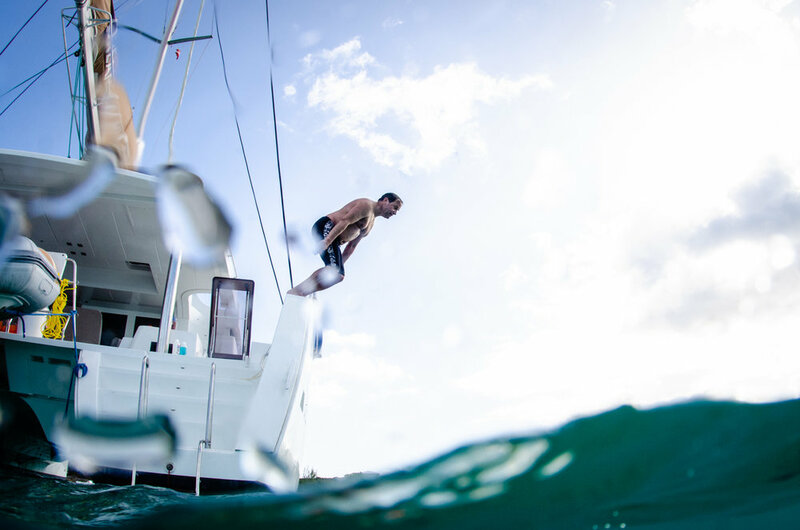 Played out, we climbed aboard and made sail for our afternoon location, one new to us, Sandy Cay. We plotted a swim but Dave lead the entry charge with one of his world famous belly flops. In full disclosure, it wasn’t Dave’s best performance. But at the end of the day, it didn’t matter. 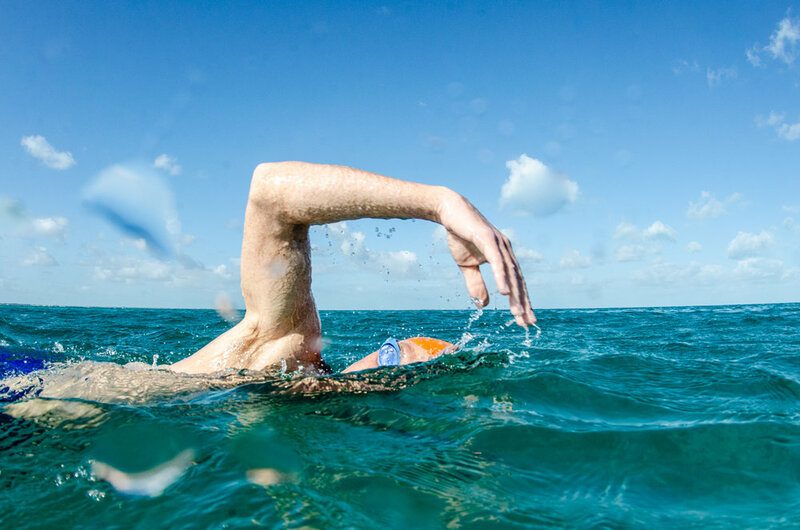 Each swimmer went in off the bow with their own signature move. Celine is an understated swimmer. She doesn’t make a fuss, she swims. She doesn’t cause any ruckus or bother, she just swims her swim, they way she wants to. So when I saw her climb to the bow, I expected a simple jump - it’s high enough for crying out loud, no need for a production. But instead, in an uncharacteristically unplanned move, she blew all of our minds and flew threw the air in a side recline pose like a total trick performance pro. It appeared, however, that she hadn’t considered the landing, and came down on the water with the most spectacular flop. The surprise of it. The thrill. The splash. It was simply a show stopper. So when seasoned pro Dave Barra threw the triple triple combo, Celine, the underdog, came in and threw the quad. Gold medal, game over. Perhaps you had to be there. But really, it was the stuff of SwimVacation legend. 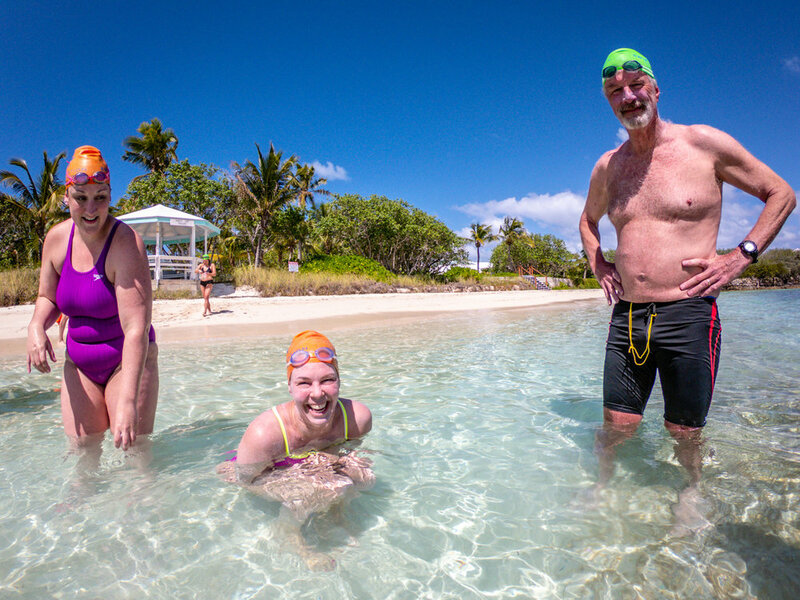 So we had this great little swim along an ancient and uplifted coral reef, across a little channel to one final beach and gathered for a parting group shot. Then, a long sail. Yachting, as our skipper called it. We just sailed for the fun of sailing. Regrettably it was time to return to the marina where we docked and carried on with a merry final night, complete with laughter and stories and our trip slideshow. Bitter sweet for sure. We say this a lot, and it’s true of almost all of our groups, but this group has been a blast in the degree to which they enjoyed what we do, and each other. Saying goodbye is a tough one. Thanks Susan for all of your incredible help this week, thanks to my fellow guides The Daves for your expert guiding of this great group of swimmers, facing all kinds of weather and being flexible and fantastic. Thank you to our fantastic crew for sailing us and feeding us and keeping us safe and happy (here’s to another!). Thank you so much to all of you for the play and the laughter and gameness and fun. It’s been such a special week. We’ll keep in touch and swim together again. The bonds we make in this salty sea are strong and lasting.